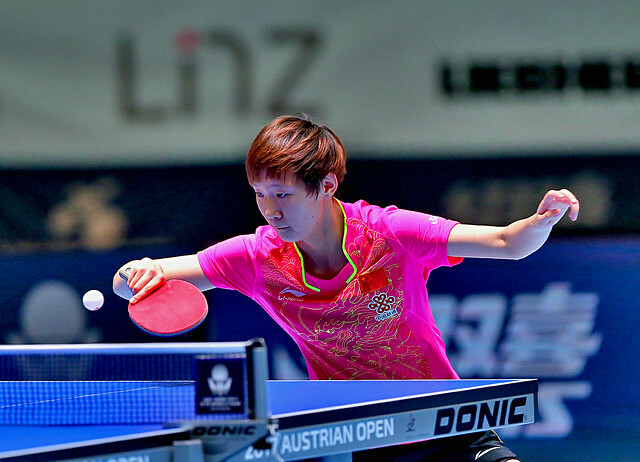 The second day of the Seamaster 2017 ITTF World Tour Platinum, Hybiome Austrian Open in Linz was very much dominated by Chinese competitors with the country's players picking up promising results across the two singles events on Friday 22nd September. Take a look below for a brief summary of the key moments from Day Two. Gu Yuting was one of the star performers on the opening day of the Women’s Singles main draw following her amazing display against the no.2 seeded player Miu Hirano, and the Chinese competitor has extended her campaign in Linz with another positive effort. Taking on Yui Hamamoto in the Round of 16, Gu Yuting stormed to a comfortable win (11-6, 11-5, 11-8, 14-12) to set up her third straight fixture against a Japanese representative with the no.10 seed Hina Hayata providing the opposition in the quarter-finals. Top seed Chen Meng remains in the hunt for her third Women’s Singles gold medal on the 2017 ITTF World Tour after the World no.2 successfully negotiated her second match of the main draw in Linz. Emerging victorious over the course of five games Chen Meng proved too strong for the 15th seed Lee Ho Ching (11-7, 11-6, 11-9, 12-14, 11-3), moving through to the last eight with little difficulty. There were also a number of encounters featuring two Chinese representatives facing off against one another, including a thrilling win for Sun Yingsha who saw off Chen Xingtong in seven ends (3-11, 15-13, 13-15, 13-11, 9-11, 11-6, 11-7). Bastian Steger bid farewell to the Men’s Singles tournament on Day Two of the main event, as the qualifier from Germany exited the competition in the last 16. Despite claiming an early lead in the tie Bastian Steger was beaten across six games by Brazilian rival Hugo Calderano (6-11, 11-7, 13-11, 3-11, 12-10, 11-5) while a defeat for Ruwen Filus against the second seed Koki Niwa (10-12, 11-7, 11-8, 11-9, 6-11, 8-11, 11-7) marked the end of the road for Germany in the category. Austria’s presence in the Men’s Singles competition was also brought to a close with the host nation’s Robert Gardos and Stefan Fegerl exiting to Chinese opponents Lin Gaoyuan (10-12, 10-12, 11-7, 11-5, 9-11, 11-8, 11-6) and Yan An (16-14, 9-11, 11-9, 4-11, 11-4, 11-2) respectively. However, Europe still has one last hope after French star Simon Gauzy recovered from a game down to beat Japan’s Misaki Yoshida (3-11, 11-3, 13-11, 11-9, 11-7). The Men’s Doubles and Women’s Doubles events held two rounds of action on the second day of the Seamaster 2017 Austrian Open, as the list of title contenders was reduced to two partnerships in both competitions. German fans were left disappointed with the outcome of the Men’s Singles event on Day Two, but the country still has an opportunity to claim silverware in Linz with Ruwen Filus and Ricardo Walther coming through their semi-finals encounter against Fang Bo and Zhou Yu in style (3-11, 11-8, 9-11, 11-9, 11-9). Honoka Hashimoto are just one win away from reaching the top step of the Women’s Doubles podium following a strong display from the Japanese duo in the last four against Austria’s Sofia Polcanova and China’s Wang Yidi (11-9, 11-7, 11-4). Chen Xingtong and Sun Yingsha await the top seeded pair in the final.